These sound good; I've never tried any vegetarian "meatless ball" recipes that didn't include legumes, so I'll have to give these a go. That sounds fantastic. We love Korma. Do you think this would translate into a "meat"loaf? I haven't used mushroom meat before. I'm intrigued. I usually use nuts in my meatballs. Justin, I made these and they were delicious- no problem with any excess liquid at all. Wondering if you have a variation for these that would go well with a comfort food menu (roasted mustard potatoes, cheddar broccoli soup, homemade applesauce, etc.) Thinking sage but not sure what else... Love your blog! Any chance these would work with less oil? I think so. It's just to give it a little;e crust on the outside. It adds texture. These look great. Do the freeze well? I would love to make a big batch to use half of now and freeze half for future use. Freeze them on a sheet tray and then place them in a food storage container. They'll do great! 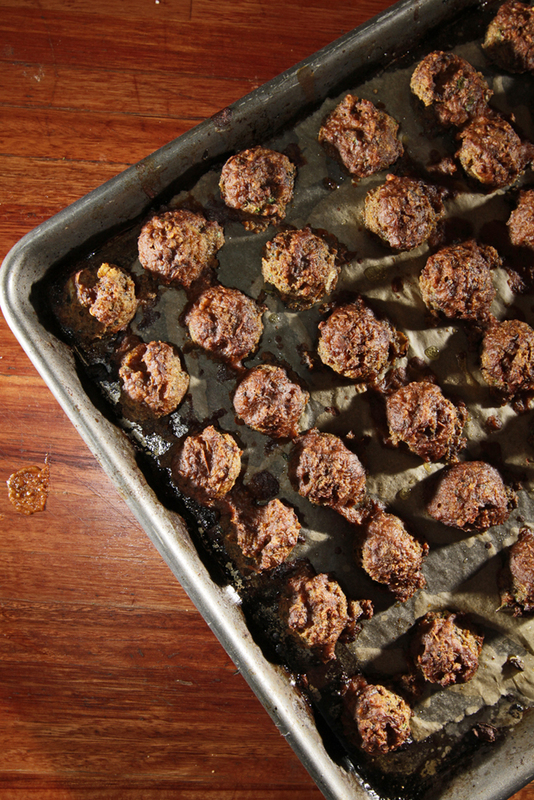 I would serve them with onion gravy and rice, like the canned meatballs I loved as a kid. And I want some right now! Unfortunately I don't have the ingredients to make up the mushroom meat, but I'm definitely going to try it. I make veggie haggis using portobello mushrooms and sometimes walnuts, I might try putting aubergines in it too. I told my partner to hide them and not to tell me where they are or I'd eat them all. One of the greatest vegetarian foods I've eaten in 35 years. If only you could mass produce them. Thank you! Thank you! Thank you! Must try this recipe. Looks delicious!!! My step-daughter is vegetarian and when we have her, I want to support her the best I can. So I am always on the lookout for tasty vegetarian recipes. This one sounds so good my husband might even eat it! As for me, I go both ways. Have you ever traded out the eggplant for zucchini? Sue, I think there would be too much moisture for hat to work, but I say give it a try and report back. You never know! 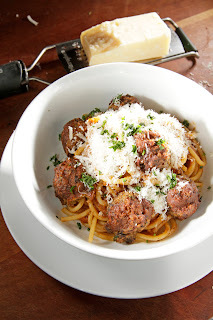 I am newly vegetarian and wondered how I would survive without meatballs - I make some tasty ones! These are a delicious replacement. I have already eaten two and it's not even dinner time yet. Thank you for this recipe! Hi! We haven't tried it without eggs, you know, as the binder, but let us know if you find something that works. These came out quite good. I would like to note that the recipe specifies 2 buillon cubes, and mine were extra large cubes - I didn't notice until after I had cooked everything, which explained why things were so well-seasoned. Just be sure to double-check that you have/use the single size buillon cubes or adjust appropriately!